I recently came across an interesting post at Gothridge Manor about one of AD&D’s weirder rules: experience for death. The 1st edition Dungeon Master’s Guide rules that a character who dies and is subsequently brought back to life earns 1000 experience points (XP). In old-school D&D, you generally got XP for defeating monsters and gaining treasure, with a few interesting exceptions like the above. These days, many games use a fairly abstract system of awarding XP wherein characters are awarded a set amount of XP for a combination of in-game success and good roleplaying. The cover of the 1989 Rolemaster boxed set. That’s a fine way to do it. But the “experience for death” rule reminds me of the quirkier and much more ambitious method of awarding XP found in the pages of the Rolemaster RPG. Rolemaster, itself pitched as a more “realistic” take on fantasy adventuring than its contemporary AD&D, awards XP for extremely specific individual in-game actions. For instance, in classic Rolemaster (2nd edition, and perhaps in other editions too), your character gains experience not just for defeating an enemy, but for each point of damage dealt to an enemy. And going beyond that, you gain experience for each critical hit (i.e., severe wound) you inflict. In fact, you get XP for each wound inflicted on you. (And yes, you get experience for dying and then coming back to life.) Outside of combat, you get XP for every mile your character travels and for every impressive physical maneuver your character pulls off. There are specific XP awards for casting spells and even for coming up with good ideas. The paperwork is oppressive; even my nerdy junior-high gaming group, always eager to squeeze as much XP out of a gaming session as possible, usually failed to diligently record every single blow landed in combat for later XP calculation. These days I’m lucky if I remember approximately how many orcs the characters beat down in the course of an evening’s game; I can’t imagine filling out Rolemaster’s intimidating experience tracking chart, faithfully marking down the severity of each critical wound delivered in the course of a routine fight. Experience for failure. It might seem odd at first that your character would earn experience for being struck or seriously wounded in combat. If your character is getting slapped around in a fight, isn’t he “losing”? Perhaps, but consider the educational power of failure in life. In a combat situation, you might fall for a feint or sneaky manuver once, but assuming you survive said failure, you’re highly unlikely to fall for it again. You’ve learned a lesson you’ll carry with you into future combat situations. Decreased experience for familiar accomplishments. Another neat little twist in Rolemaster is that your XP earned for accomplishing something—say, defeating a goblin—is multiplied by a different value depending on how many times you’ve accomplished the task in the past. If this is your first goblin kill, you get five times the normal XP for pulling it off. After you’ve taken out a few of the green nuisances, that multiplier value goes down; you’ve done this enough that you’re not learning as much from it. And when you reach the point where you can singlehandedly plow through an ocean of the luckless beasts, you’ve probably got the goblin-whomping down to a science and are getting 1/2 of its normal XP value. All in all, I’m fine with the more abstracted system of awarding XP. D&D 4e’s method of assigning experience points to the entire group based on the difficulty of a particular challenge is probably close to my ideal. But I do sometimes miss the very detailed method, and the slightly unconventional uses of XP it allows. I love the Rolemaster XP system, but then I loved playing in my youth. The casting XP was a good balance to the direct damage XP fighters got. I also loved the death blow XP. That was another good spell caster angle. 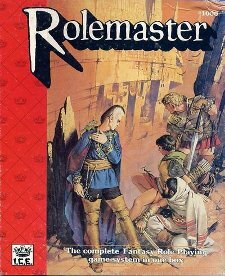 The Rolemaster system begs to be used in a cRPG, as it has better dynamic verse the older D&D system. In my humble opinion.